The films greatest strength is it's two main characters, Colin and Miles. They grew up together in Oakland, and it's the only home they've ever known, for better and for worse. In ways, they conform to the stereotypes that most people probably have about people like them who live in Oakland. They're kind of thuggish, Colin starts the movie on parole right after being convicted of a felony, Miles wears a grill, etc. They are very obviously born and bred in Oakland, and a good chunk of this film is basically a love letter to what Oakland is and always has been, railing against the gentrification of the neighborhood and the attempt to push people like Colin and Miles out. The relationship between Colin and Miles however is the meat of the film, being both its most personal and its most political element. Colin is black, and Miles is white. The movie explores the difficulty that both of them face individually and together because of these things. In weaker hands, this sort of thing could be hackneyed, cheesy, forced, or what have you, but the two main actors are so convincing that it's hard to believe that they aren't just playing themselves, which is a fantastic plus in the movie's favor considering how much the heart of the film lies in this friendship. Rafael Casal in particular is extremely impressive considering the man has zero film acting credits to his name. Watching this movie I would have thought he was an experienced actor in his element, and this effortless ability he seems to have lends itself to the tone of the film. A lot of the movie is lighthearted which is highlighted by the constantly hilarious dialogue between the two and the constant freestyle rapping the two do with each other, which in a way is the most obvious highlight of the depth of their friendship in how they are so easily vulnerable with each other in a town where vulnerability is not something you want to show. The actions and consequences that both of them face though are unequal, which leads to a lot of dramatic tension that bubbles to the surface in the third act. Because despite the fact that a lot of the movie is funny, and that a lot of the movie is more of a character drama than a film with any overarching plot, the third act escalates a lot of the growing tensions of the movie into a subject that is deadly serious. Early in the film, Colin is witness to the police fatally shooting an unarmed black man, a now common occurrence in America. He carries this weight with him knowing that justice won't be served, and that in so may ways it could have easily been him. This memory sticks in his head, he becomes frozen in fear at the sight of a police car, he has constant nightmares about the event, and despite trying to play it all off like he's cool and able to handle it, under the surface he's in deep pain. The movie does a fantastic job at helping you get into Colin's mindset, because obviously as a white guy living in a Dallas suburb, I have no life experience that can bring me anywhere close to how someone like Colin must feel. Blindspotting not only helps someone like me understand and empathize with Colin, but it also takes the brave step of having both Colin and Miles admit to and externalize their fear and pain. Men in general are expected to be tough and cool, to weather everything with a stoic passiveness that implies we can handle it all without breaking a sweat. But Colin and Miles, two tough characters living in Oakland, shed tears. They cry, they admit that they're afraid, and they let their rage burn brightly as they scream at the injustices and trials they have to live through. I'll say it now, this movie is not subtle. This movie has an obvious message from the very beginning, and the climax of the film essentially boils down to Colin free-styling about the unending terror and hatred that a black man in America has to live with. But sometimes, that's what the world needs. The world needs to be grabbed by the shoulders and shouted at sometimes in order to get a message across. When people are dying in the streets, and no one seems to care, you begin to live with an anger that has no positive outlet. The reason Colin was in jail was because he took his anger out on a person he saw as a symbol of all the things he hates, and the underlying current of this entire film is the pain and hurt that Colin and Miles feel, and their inability to do anything positive with these feelings. There's been criticism leveled against the movie for it's lack of subtlety, for it's outrageous third act, and for it's lack of thematic consistency. The film critic in me agrees with these things to a degree, particularly the fact that despite the love I have for movies that can be both funny and serious, I do feel that Blindspotting doesn't transition between the two in an elegant enough way. This for some viewers could threaten their ability to take the movie seriously, not knowing which moments are being played for laughs and which are meant to take seriously. This is an issue that I think a lot of audiences have in general, weirdly enough, where they laugh at serious moments or don't understand when something is meant to be funny. 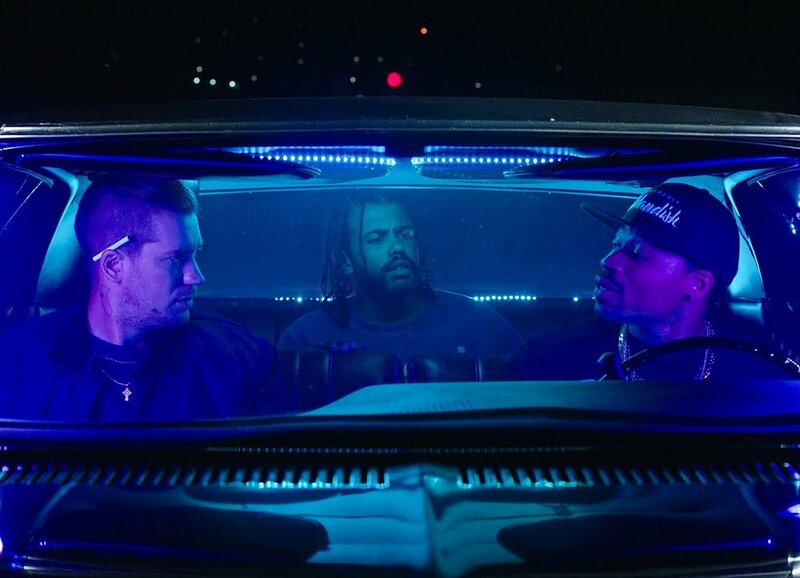 I think Blindspotting handles this well enough that it's not confusing or badly made, but I think the widespread appeal of the film is lessened because of it. This concerns me more than it usually would, simply because I believe in this movie. I believe in it's message and the way it tells it, and I believe in it's unapologetic celebration of a way of life that parts of the country would view as undesirable. The power of film is that when done well, it has the ability to transport into worlds you're unfamiliar with, whether that be a far off planet, or Oakland. Blindspotting drags it's audience into the hood and shows them that maybe these people aren't as bad as you're painting them to be. Maybe these people are hurt, oppressed, and unwanted, and they react in extreme ways because they're secretly terrified that their way of life is going to go extinct because the rich decide that it should be so. That is where this rage comes from, this rage that is buried underneath the cool, funny exterior of those living in Oakland and areas like it. To me, this narrative is where the film's uneasy balance of funny and serious comes from. It's simply a representation of these people's way of life, and while there may be more elegant ways of putting it to the silver screen, the message itself is still powerful enough that it shines through any missteps the movie may take. I'm going to be seeing Blindspotting again soon, not only just because I enjoyed it, but because I feel like I need another opportunity to witness the power this movie holds. The honesty, the bravery, the rage, the outcry, all of this pours out of the screen over you as you watch it, and all I could think leaving the theater was that I genuinely wished people would see this movie so that they could maybe understand the perspective of someone who wasn't like them. I know people won't go, I know that Blindspotting will spark no revolutions, but I applaud the filmmakers and all the people behind it for trying. It is through their efforts that the general cultural consciousness can begin to turn in their favor, and maybe if only a few people's minds are changed, we can say that it's enough to call it a success.